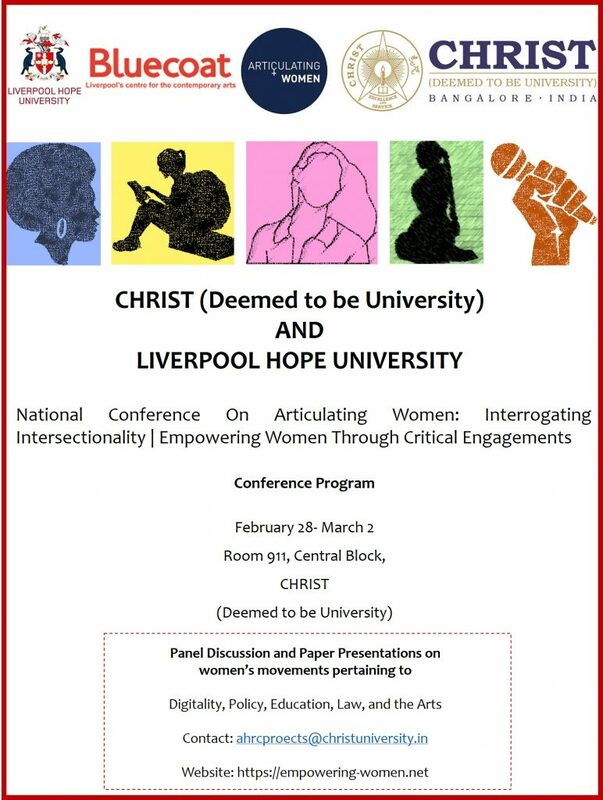 This conference, organized by Christ University, Bengaluru (Deemed to be University) and Liverpool Hope University, UK, will explore the contours of women’s movements in India and beyond. Urvashi Butalia (1998), Ritu Menon and Kamala Bhasin (1998) speak about a deliberate and structural silencing of women’s voices in India before independence and provide a critique of the patriarchal within our documented history. Our conference will provide a space for individuals associated with the women’s movement in India to assess the past, present and future of the movement; it will also provide an opportunity to trace the issues and methods of the movement across disciplines, genres and in different spaces, at the intersection of gender, caste, religion, class, and race. We welcome papers by women speaking about movements that have touched their lives; about the relationships of the movements to the nation-state; and about the necessary redefinitions of the movements in ‘authentically’ belonging to India. In the interest of resisting the forced separation between theory and practice, we are looking for testimony uncovering the politics on the ground. A critical review of the women’s movement in India focusing on the factors that motivated the movement, on issues that sustained the movement; and on the conflicts, confusions, and disagreements that have shaped the movement. A discussion of how, within the curriculum, pedagogy can address questions of intersectionality, violence, marginality, diversity, and democracy. An analysis of technology and the digital world as both antagonistic to women’s interests and as a tool for promoting women’s issues through representational strategies and narrative forms. An examination of the impact on women and women’s issues of policy interventions within higher education, the sciences, the arts, and in the worlds of information technology and digital spaces. Papers on these and related themes are welcome from researchers and faculty across all fields. Additionally, we welcome proposals by those who interested in forming a panel on other specific themes related to gender issues. Poster presentations are also encouraged.